You don’t want to miss this cast when “Father Figures” arrives on Blu-ray Combo Pack, DVD and Digital. “Father Figures” marks the directorial debut of veteran cinematographer Lawrence Sher (“The Hangover” films). In the Alcon Entertainment comedy “Father Figures,” Owen Wilson (“The Grand Budapest Hotel,” “Wedding Crashers”) and Ed Helms (“The Hangover” films, “We’re the Millers”) star as fraternal twins Kyle and Peter who accidentally discover they’ve been living with a lie all their lives. It also stars Oscar winner J.K. Simmons (“Whiplash”), comedian Katt Williams, NFL Hall of Fame quarterback-turned-actor Terry Bradshaw, Ving Rhames (the “Mission Impossible” films), Harry Shearer (“The Simpsons”) and Oscar nominee June Squibb (“Nebraska”), with Oscar winner Christopher Walken (“The Deer Hunter”) and Oscar nominee Glenn Close (“Albert Nobbs,” “Guardians of the Galaxy”) as Kyle and Peter’s mother. Sher directed from a screenplay written by Justin Malen (“Office Christmas Party”). The film was produced by Academy Award nominee Ivan Reitman (“Up in the Air”), Ali Bell (“Draft Day”) and Alcon Entertainment’s Academy Award nominees Broderick Johnson and Andrew A. Kosove (“The Blind Side”). Serving as executive producers were Tom Pollock, Scott Parish, Chris Cowles, Chris Fenton and Timothy M. Bourne. An Alcon Entertainment presentation, a Montecito Picture Company Production in association with DMG Entertainment, “Father Figures” is distributed by Warner Bros. Pictures, a Warner Bros. Entertainment company. “Father Figures” will be available on Blu-ray Combo Pack for $35.99 and DVD for $28.98. The Blu-ray Combo Pack features a Blu-ray disc with the film in hi-definition, a Blu-ray disc with the special features in hi-definition, a DVD with the film in standard definition, and a Digital version of the movie. “Father Figures” will also be available on Movies Anywhere. Using the free Movies Anywhere app and website, consumers can access all their eligible movies by connecting their Movies Anywhere account with their participating digital retailer accounts. 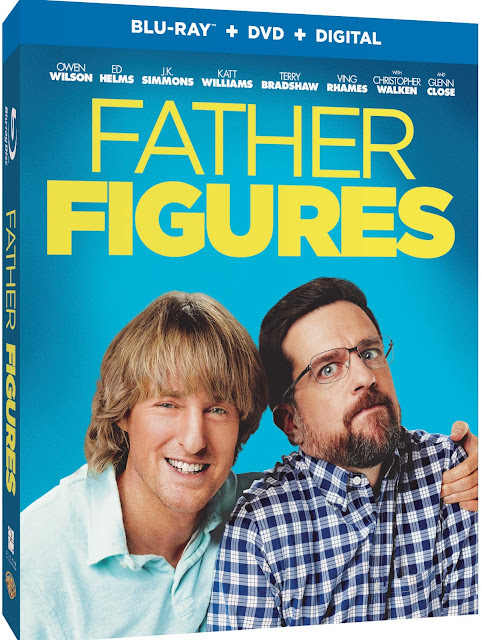 Fans can also own “Father Figures” via purchase from digital retailers beginning March 20th. SYNOPSIS: Fraternal twins Kyle and Peter accidentally discover they’ve been living with a lie all their lives. The kindly man in the photo on their mantle isn’t their father after all, but an invention their mother (Glenn Close) concocted to conceal the truth: that she actually doesn’t know who their real father is. See, it was the seventies, and things were crazy, and…well, you know. Armed with only a handful of clues, the brothers resolve to find the mystery man in what results in a wild road trip of discovery and revelations—about their mother, themselves and each other.